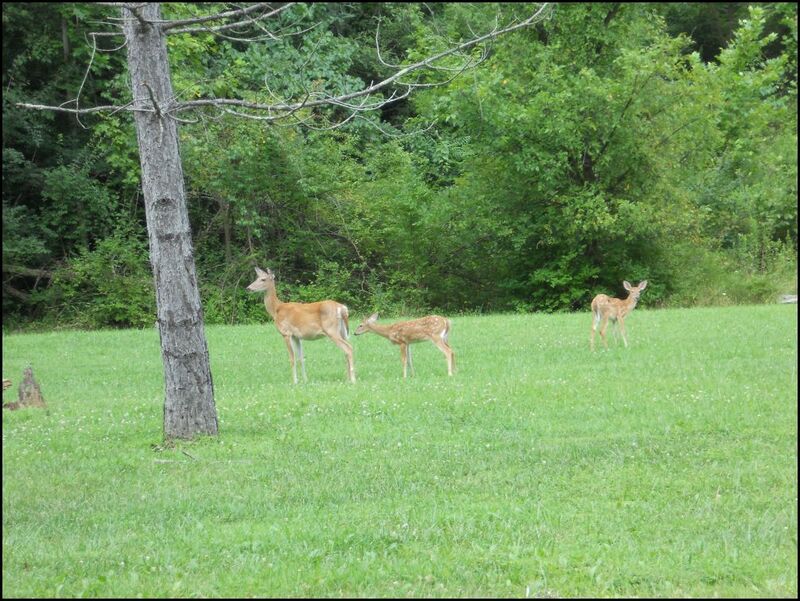 Two on the right were gifts for friends; two on the left stayed with us. I was looking through my email when I found a pattern from Knitpicks that intrigued me. 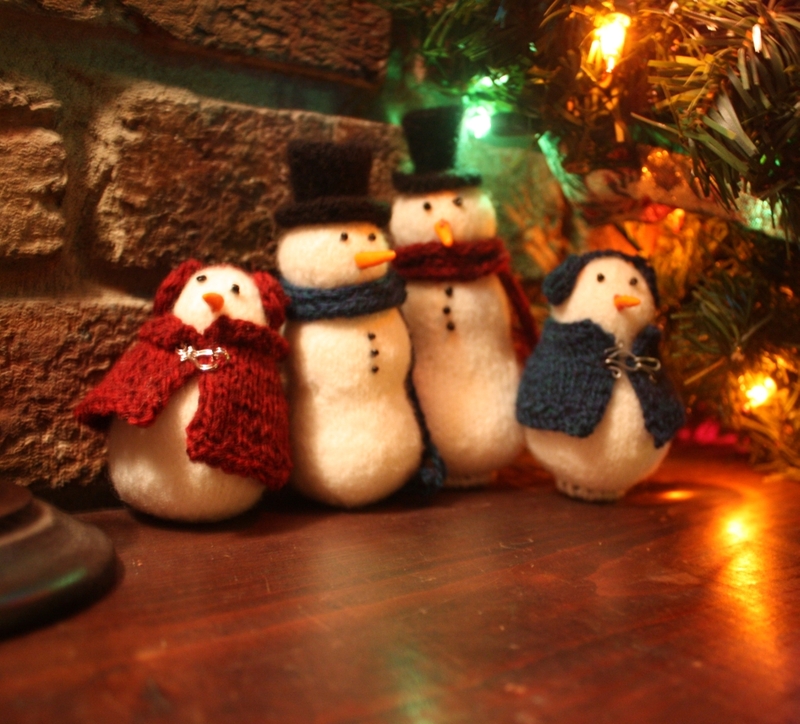 I ended up knitting five of these little snow people. I kept two, haven't quiet finished two, and gave two away as a Christmas gift. Pattern: Knitpicks Lumpy, Rosy and Slim by Melissa Burt. I haven't made Lumpy, but I have made the other two. I followed the pattern as written except that I used a smaller needle (just because I knit loosely. I have found on Ravelry that many people who knit them haven't felted them, but I much prefer them to be felted. I've included a picture for comparison. The felting just makes them look much more like snow -- more professional the finished (in my opinion). I felted them by hand in the bathroom sink. 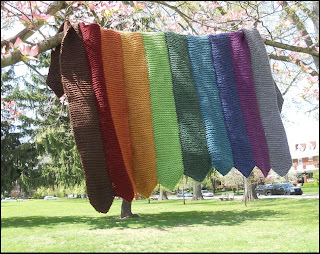 Yarn: Knitpicks Palette in various colors -- white, black, garnet heather, and marine heather. 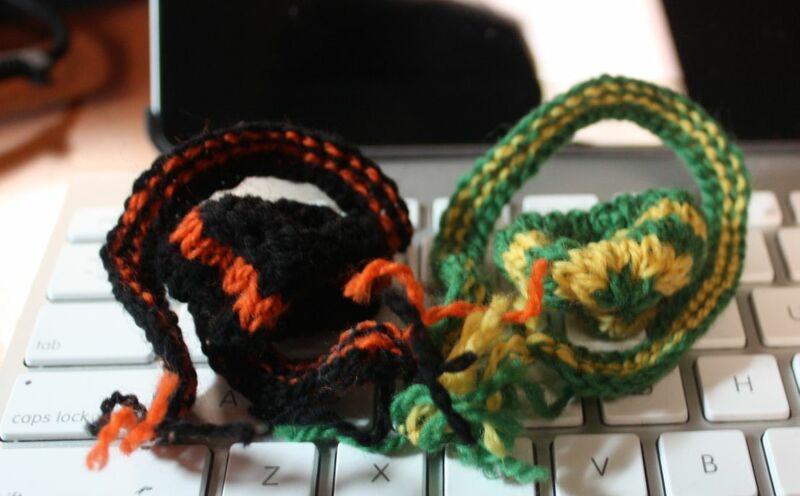 I also picked up an orange, green and yellow to finish off the last two I'm making. Those two, when finished, will sport my boys school colors. Felting each one took about 10 minutes, and as the felting came to an end I could feel the object shrink and could see the stitches disappear. I made their noses out of orange polymer clay with a hole in one end to sew it on. The clasps on the capes are also handmade with jewelry wire. Fun pattern -- enjoyed it. For the second year in a row, I have knit a scarf for the Red Scarf Project of Foster Care to Success. These scarves are packed in care packages and sent to students in college or trade school who have "grown out of" foster care. The packages are sent for Valentines' Day (which explains why all of the scarves are red). 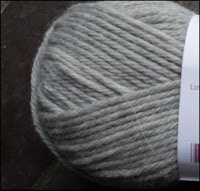 Yarn: I wanted something worsted weight, wool and washable, so I chose Swish tonal from Knitpicks. It is in the Gypsy colorway. I haven't gotten a good picture of this scarf. The lighting in my office isn't doing it justice, and I'm ready to mail it away. Even though I haven't posted in a while, I'm still knitting. I have at least two finished objects I need to photograph and post; I'm hoping to do that soon. In the meantime, I am knitting, but I haven't landed on the next "big thing." I'm working on finishing some projects that I started previously while I wait for inspiration to strike. The image to the right is a scarf I'm working on. It's 2 x 2 ribbing with alternating two row stripes of a pair of yarns I picked up in Alaska. More details are in this post, but the two yarns are by Rabbit Run, in the water and wildberry colorways. Wildberry looks a lot like water, but includes a cranberry color along with the water colors. Because the two yarns have much in common, the scarf doesn't look striped, but blends very well. It's the project I pick up when I don't have anything else to knit, or when I need a movie knitting project. Eventually, it will get finished. 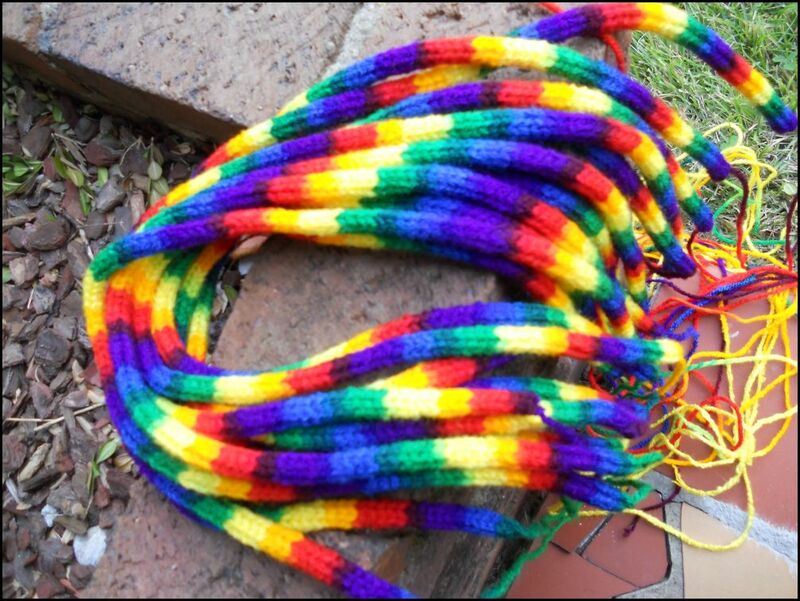 The next two pictures are of some lanyards I knit to be used by my Emmaus Community for pilgrim's crosses. About 30 or so are required for each walk. The gentleman who used to knit them worked on them all year round, knitting away. He died, so the community has picked up his ministry. They are made using Red Heart yarn, Mexicana colorway, with a French (or spool) knitter. Even my husband picked up the needles for this one. We each knit 12 of them. For pattern information, just google Emmaus lanyard. It is simply a 24 inch long i-cord. I tried knitting one with double pointed needles, but the result was not as neat as with the spool knitter. These were quiet a distraction for a while, taking me away from my other knitting. Soon, I'll post about this year's Red Scarf Project and the hat I just finished. 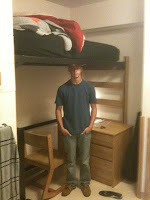 It's finally finished and has been delivered to his dorm room. Meet my Mitered Cross Blanket. It is probably the biggest thing I have ever knit by size. Maybe something I've done has had more stitches, but I'm positive nothing has measured this large. We moved our son to college a couple of weekends ago, and I packed this blanket in a care package with snacks and supplies, along with a letter, explaining about the blanket. 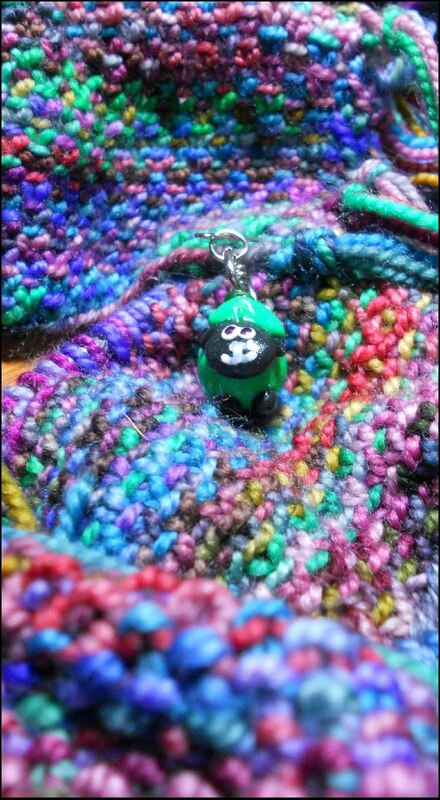 Yarn: I used all Knitpicks yarn -- Chroma and Wool of the Andes (WotA) .G is a freshman at West Virginia Wesleyan College. 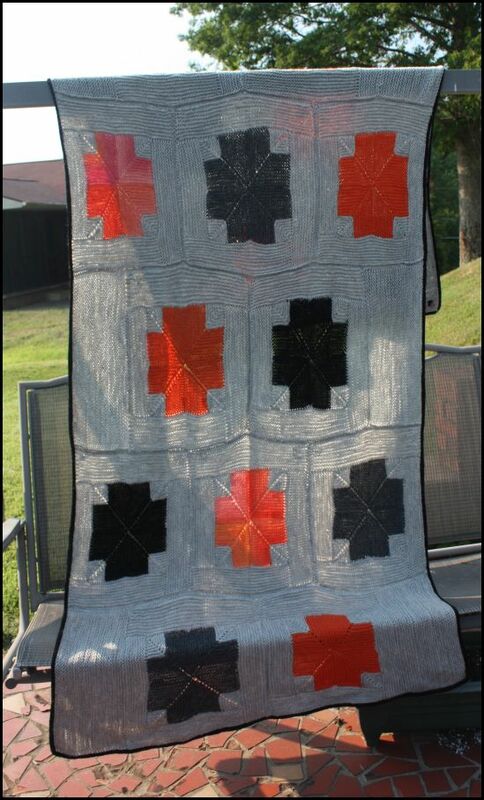 The school colors are orange and black; that dictated the colors of the blanket. WotA in Orange. I used two skeins to make four squares and had almost none left. WotA in Cobblestone Heather. I used two skeins to make four squares. WotA in Dove Heather. 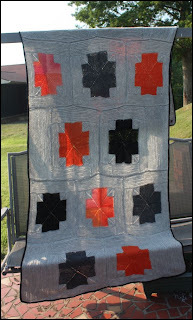 I think I used 19 skeins as the background color for 15 squares and 6 half squares. Needles: US Size 6 Knitpicks options needles. I used both the nickel plated and harmony interchangable needles, depending on my mood. For the icord, I used nickle plated dpn. 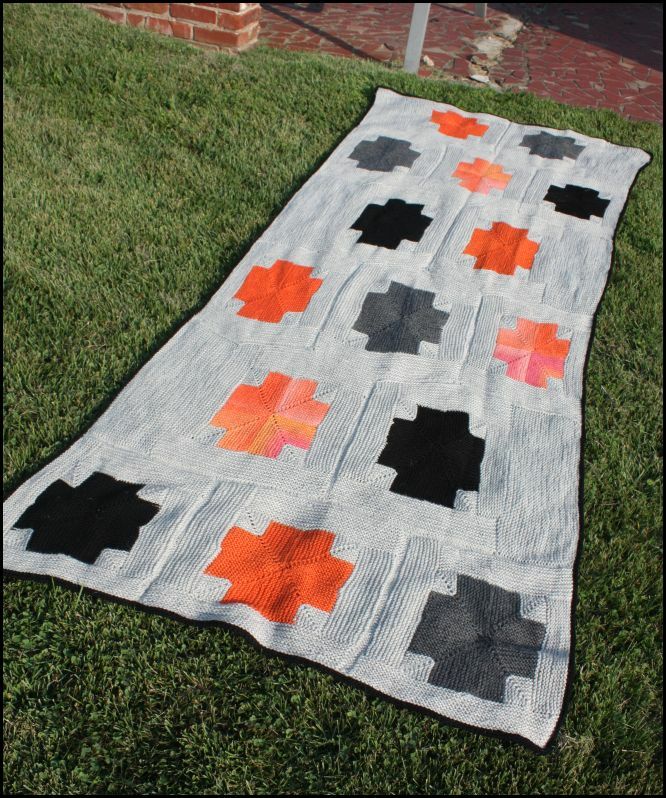 Pattern: Mitered Cross blanket for Japan by Kay Gardiner of Mason-Dixon Knitting. Here's the Ravelry link, and here is a link to April in Mason-Dixon Knitting. 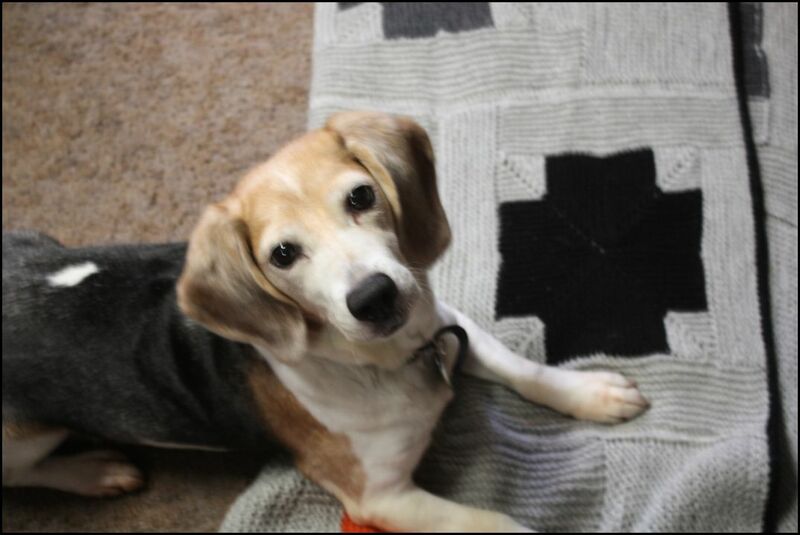 If you scroll down, you'll see Kay's blanket and a link to buy the pattern -- proceeds go to Japanese Earthquake relief. I love that buying the pattern benefits others, and I hope when I told that to my son, it said something to him about serving others and its importance. My son is over six feet tall, so I added two rows of squares to the blanket for a total of 15 squares in six rows. I did the icord in a contrasting color (coal). I liked the look it gave the blanket -- it just seemed right for G. I added a yarn over to the icord repeats -- knit-knit-yarn over-knit through back loop, and then I passed the yarn over over the final knit two together through back loop. Somehow the yarn over covered the stripe. 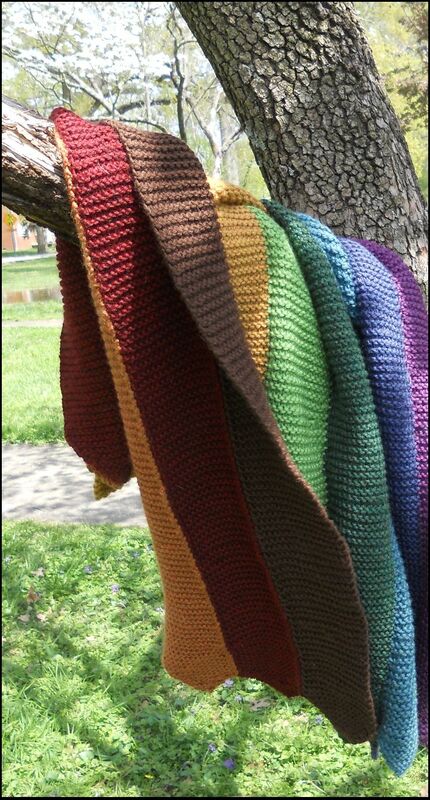 By the way, go buy the pattern -- even if you don't plan to make the blanket. It's a good thing to do. Size: I thought I was making a 6 foot by 3 foot blanket. It turned out to be 8 feet by 3 feet, 3 inches. I have no idea how it ended up so long, but he'll have lots of room to snuggle in this behemoth. Final thoughts -- This is a great pattern that is interesting enough to knit for a long time (3 months) but simple enough to not be frustrating. I enjoyed the knitting. It was a great project to carry me through the transition of my son's high school graduation and his summer before college. I was able to knit my love into something warm to leave with him at school -- something that left an important message about caring for others. Something that told him how much he is loved. 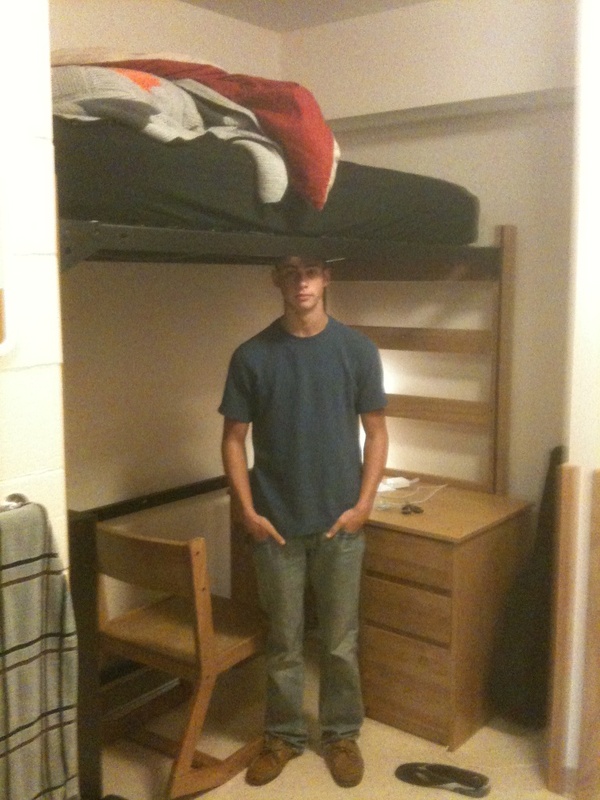 He texted his dad a picture of his newly lofted bed today. Check out what's up there -- the blanket. Cool. 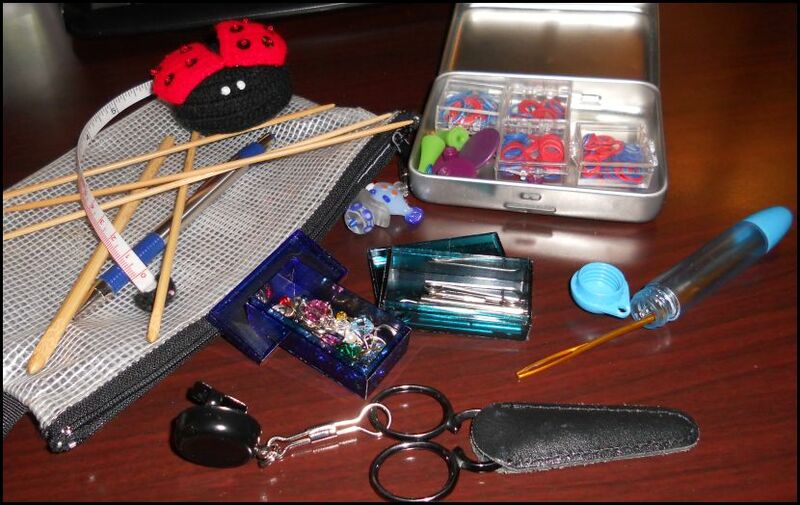 What's in your knitting tool bag? I carry a small tool bag in my knitting bag -- I've tried to make sure it has any kind of tool I might need as I knit. I emptied it out and tool a picture of it so that you can see it. Three dpn -- bamboo. I'm not sure what size, but I keep them in there to pick up stitches or serve as a cable needle. Two crochet hooks -- bamboo. They are part of a set of hooks I have. They are in the bag because I labor under the illusion that I can use them to pick up stitches when I drop them, or when I let them drop to fix mistakes. In reality, I don't find them very helpful, very often. Blue ink pen -- I read somewhere to keep one in my tool bag, so I do, but it doesn't get much use. It's a Zebra brand pen, though -- I love Zebra pens. Tape measure -- it's from Lantern Moon, and looks like a lady bug. I had one that looked like a sheep, but our dog ate it (or a large piece of it). Metal box filled with ephemera. I decorated it with a sheep on the lid, which has since worn off. I keep thinking I'll repaint it, but I've never gotten around to it. Four small plastic boxes of plastic red and blue stitch markers. I use them sometimes, and I like having them in lots of different sizes. They are so inexpensive, that if I lose one, I don't care. My husband might care, because he is always finding them. Those things you put on the ends of needles so the stitches don't fall off -- what are those called? These are green and small, for sock needles. Green plastic box with Knitpicks cable connectors and several of the small tools used to tighten the needles to the cables for their Options line. Love those needles! Blue box with handmade decorative stitch markers -- more about those later. The two plastic boxes, which I really like, came from the Container Store. Chibi storage tube with needles for weaving in ends. I'm not sure why the point is bent; I guess it helps with the end weaving. My favorite tool -- a pair of Gingher scissors. Back when I cross stitched instead of knit, I found these at a Cross Stitch store. They were expensive, but I thought they were beautiful (I still do). I didn't buy them, but just mentioned them to Steve. After that, for some gift event, he gave them to me. How's that for a wonderful guy? The scissors are probably older than my kids -- maybe not quite, but close. They are black, with very pointy tips. To this day, I only cut thread with them -- nothing else. Amazingly, they are still sharp, and I still know where they are! I found the bag itself at the Counting House, a Cross Stitch store at Pawley's Island in South Carolina. It's the cradle of Cross Stitch in the United States, but has since closed. Great store; sad to see it leave. I bought the fish-bead charm that is the zipper pull on the bag at the gift store in the Macaulay Salmon Hatchery in Juneau, Alaska. Odd place to find it, but I liked it. 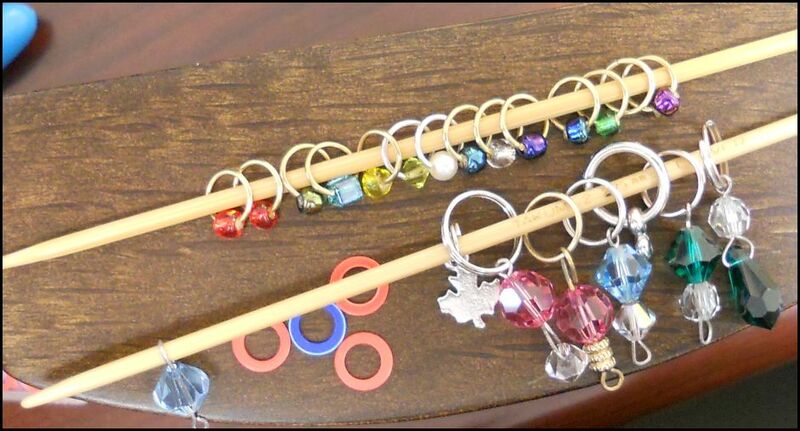 So, how about stitch markers. Do you make them? I do. I used to make the one with the danglely charms. I used them, but now I like the ones at the top of the picture. They don't dangle, and just seem to behave themselves better. All I do to make them is to split a jump ring, place a small bead at the join, return the ring to its proper position, using a little gorilla glue to hold the bead in place over the join. They work great, and the bead prevents the join in the ring from catching on the yarn. I have been knitting. I've just been knitting on the same thing each time I knit, and I haven't taken the time to take images of it in progress. The Mitered Cross blanket is finished and is currently blocking. I'll post a complete set of information for it this week, once I take its picture. I'm also behind with my Project Spectrum posts. The blanket doesn't fit with June's, July's﻿ or August's colors. Instead, here's a green picture, taken the other day. When I get some time, I'll try to put together a collage of cruise pictures -- lots of blues. Speaking of blue, I've changed the blog template. What do you think? I downloaded the template from btemplates.com -- I've never done that before. I've always just used internal blogs from Blogger. 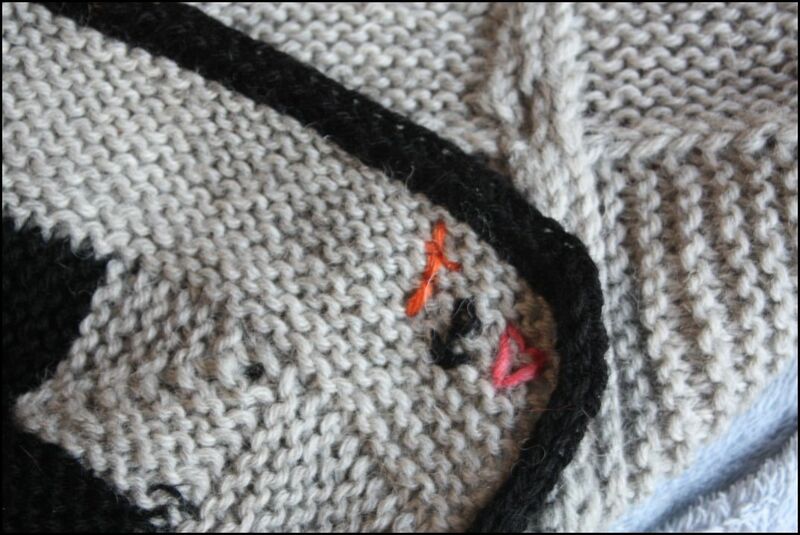 This morning, though, I looked at my knitting blog, and just didn't like it! I looked at replacements for the template among the ones offered by blogger, and nothing said "Choose me." Instead, I googled free Blogger templates, and found some recommendations for safe sites to use to download a new template. The ones on btemplates.com are rated by users, which was reassuring. I followed the instructions on the website, and it worked perfectly. I did have to go in and work a little with my gadgets, but it was time those were refreshed, anyway. So what am I working on? I worked my way through one Deep Water sock, finishing it. I started the next one, but got distracted by another project. So, my current project is Mitered Crosses. I'm planning on making it longer than in the pattern, because he is a long kid. So far, I have six squares completed. Rather than the Noro called for in the pattern, I'm using Knitpicks Chromo and four colors of Wool of the Andes. The two yarns seem to knit to the same gauge. I'm just glad I don't have to seem them together. I'm hoping the method Kay uses to form the blanket is better than the one I used for the baby blanket! Just in the nick of time for Project Spectrum - Red. 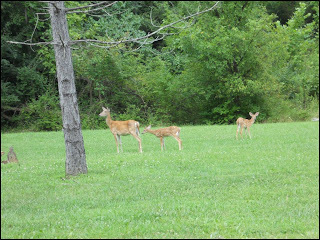 I took these pictures one afternoon at Stonewall Resort. 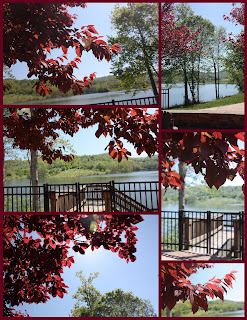 As I took them, I was thinking about Project Spectrum and how odd it was to see such a red tree on a day in May when everything around me was green. 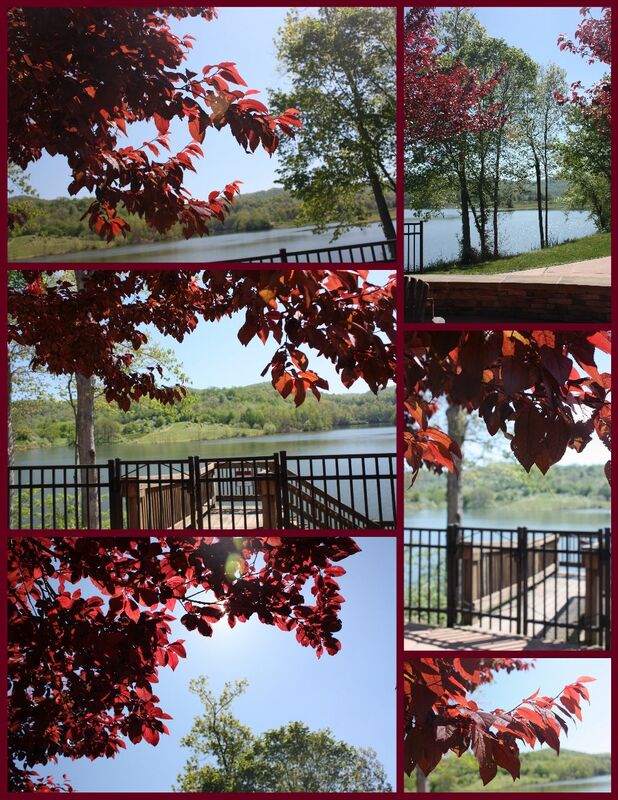 Scarlet maple is beautiful, though. Right now I have two projects on the needles that are still WIP and not UFO. I started the Koigu Linen Stitch Scarf from Churchmouse Yarns. I'm using two skeins of Koigu Yarn and one of Claudia's Handpainted yarn. 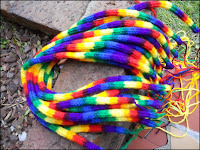 All of those yarns are from Yarn Paradise in Asheville and can be seen in this post. The person who was helping me at the yarn store pointed the pattern out for me and helped me pick the colors. I might be about halfway through -- it is knit horizontally. ﻿﻿﻿﻿﻿﻿ I have also started another pair of socks. This pair is knit with Knitpicks Stroll Tonal Yarn in Deep Waters. 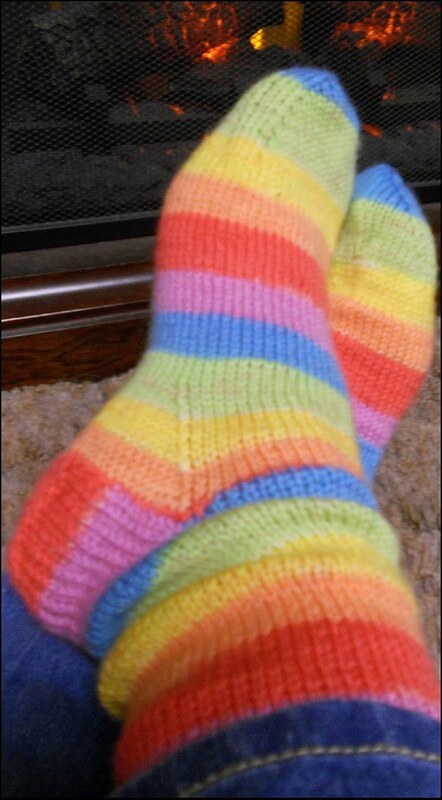 I am using a pattern from Socks That Rock, but, having learned lessons from the Emmaus Rainbow socks, went down in needle size to US size 1 and cast on 72 stitches. The pattern calls for 60, but that didn't seem to be enough. I love the color of the yarn, and I like this fabric much better. See the mouse in the last picture? She's knitting. I bought her at Yankee Candle. 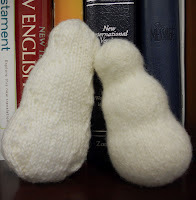 It seemed appropriate to include her in a post that talks about Churchmouse yarns. Steve was an ALD on an Emmaus walk in March and at the end of March, beginning of April, I served as an LDIT. I knew that I would be serving in the background on Steve's walk (which would mean some sitting time) and that my position of a lay director in training meant that I would be observing the entire three day walk. It sounded like a portable knitting project would be ideal. I decided on socks, and picked up my recently purchased Knitpicks Felici in Rainbow -- socks were off and running (excuse the pun). I started them the day the men's walk started and finished them the day the women's walk ended (a little more than two weeks). Rainbow seemed appropriate since it is one of the symbols associated with an Emmaus Walk. Pattern: The Yarn Harlot's "Good Plain Sock" from her book Knitting Rules (that's a Ravelry link). Needles: I used double pointed, US size 1.5. I felt the entire time I was knitting that the needles were too large for the yarn and the fabric was too loosely knit. I didn't change. I'll probably regret that, but the socks are very soft. 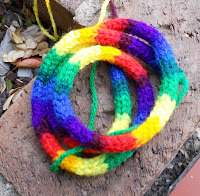 Yarn: Two skeins of Knitpicks Felici Rainbow. I worked with the yarn so that I started at the same point of each skein in the color changes. The socks are almost identical. Yes, it has been a long time since I posted. I have been knitting, but I haven't been knit-blogging. I'll catch up. I think I'll start with the biggest project I've been working on and have just finished. A young couple at our church was expecting a baby, and I decided to knit a blanket. We knew she was a she, so pink came to mind, but I worried I would get bored too soon to finish it. The mother and I share the Emmaus experience in common, and a rainbow seemed a great way to portray that connection and to remind the family of God's promises. 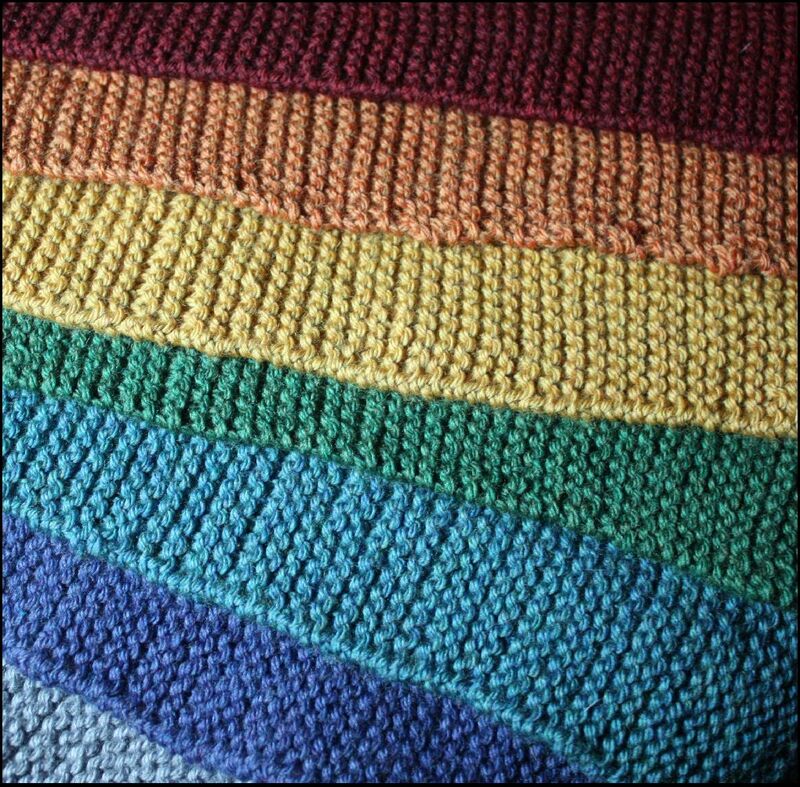 The day after I decided to knit in rainbow colors, I found the Picket baby blanket pattern on Knitpicks. It seemed perfect. Each stripe is knit separately and then sewn together. The knitting went rather fast -- it makes a great portable project, since it is knit in stripes. I discovered, though, that I hate HATE seaming. It is not portable, and I am not good at it. Last weekend, I made myself spend several hours finishing it so that I could give it to the family before the (now born) baby girl went to college. 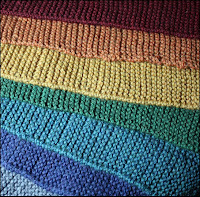 Pattern: Pickets baby blanket from Knitpicks. Knitpicks no longer carries all of the yarn called for in the pattern. I substituted bark for merlot heather, peapod for lemongrass heather, and bought the suggested moss to substitute for pampas heather. The pattern calls for 11 stripes. I ended up with 10 because I just do not like the moss at all. Needles: US size 5, circular needles from Knitpicks. My row gauge was very much off, but I think this is a pattern problem. 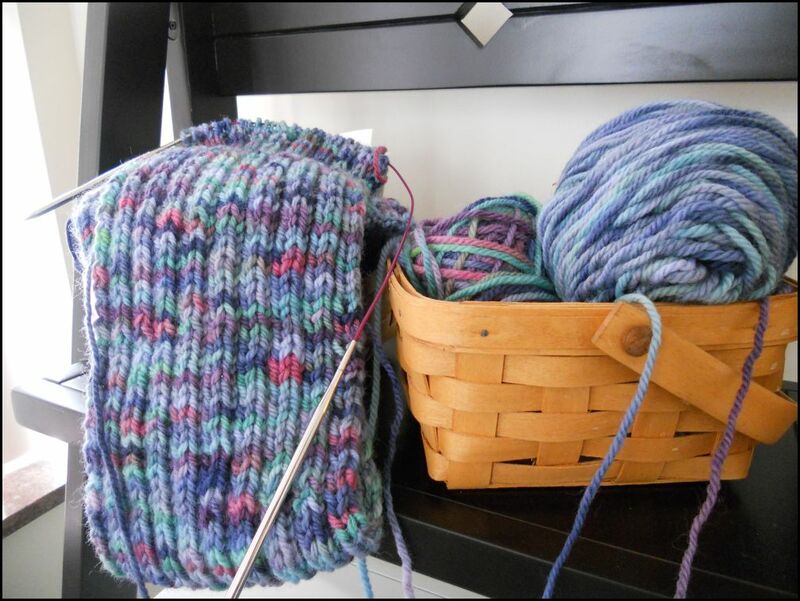 I do knit loosely, but each stripe calls for 248 rows to create a stripe (without the points) that is 34 inches long from point to point or about 30 inches not counting the points. That would be a row gauge of 33 rows = 4 inches. That pattern calls for a row gauge of 18 rows = 4 inches. It could be that there are 18 garter stitch ridges per 4 inches. That math comes out about right. I decided I would just knit the 248 rows, which came out at about the right length. It is a blanket, after all. Yarn: 10 colors of Knitpicks Swish DK including seven heathers: amethyst, marble, garnet, persimmon, grain, tidepool, forest and delft plus two non-heathers -- bark and peapod. One skein of each was plenty. CJ's baby blanket on a spring day in the park. 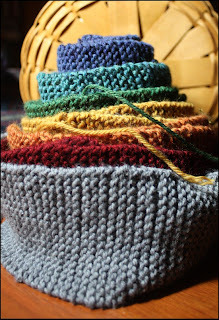 Back in July -- yes, I know -- July, I started a pair of French Press slippers. I worked on them for an evening and then put them in a bag, and didn't pick them up again -- until December. I finished both slippers and straps, felted them, dried them (took a long time to dry), and then left the pieces on the counter. For a month. This evening I purchased the buttons and sewed the straps onto the shoes. Finally. Finished. I thought I would count these as a 2010 finished object, but come on. I left the last little, tiny bit of work until February. I think I had better call them 2011. Yarn: Paton's Classic Wool in a blue / red / purple / brown mix. I bought two skeins, although I didn't use all of the yarn. The feltable wool is absolutely necessary for this project. Pattern: French Press Slippers by Melynda Bernardi. 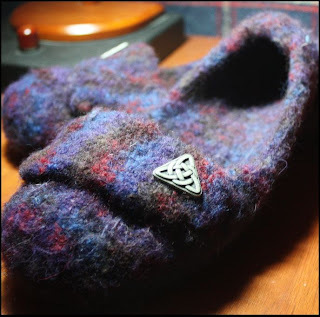 Once the knitting is finished, the slippers are felted. 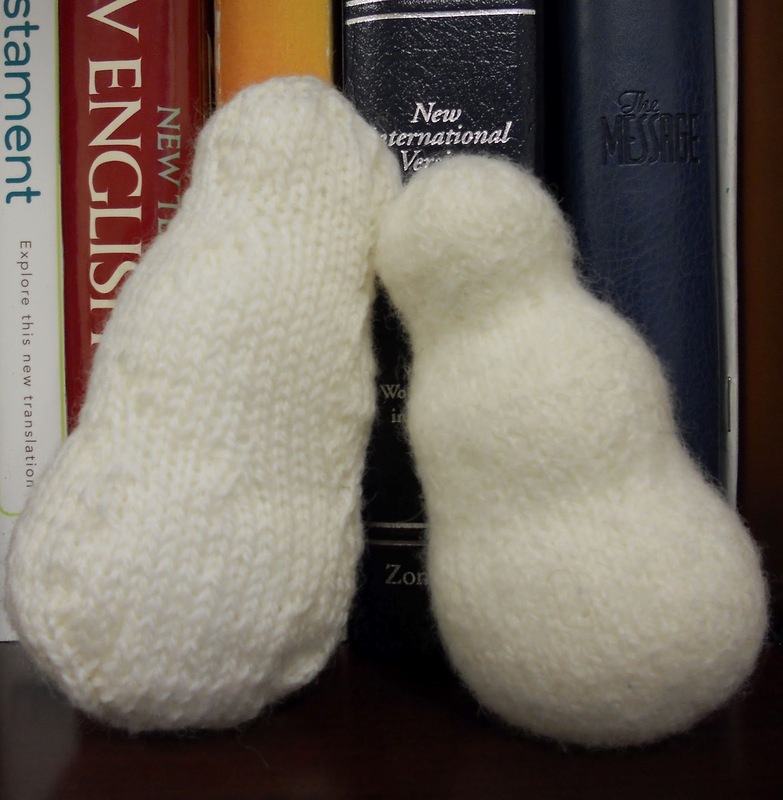 I wish (kind of) that I knit them a little smaller or felted them a little longer. The pattern is one you have to trust as you knit it. I wish I had taken a picture prior to felting. They looked like slippers for skinny footed giant. ﻿﻿Six years ago today I started my first blog to talk about knitting. It seemed to be a strange thing to do, but as many people who started blogs at the same time said, I was reading other knitting blogs and decided to try it as well. 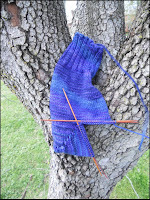 It has been a great way to record my knitting projects -- an online knitting journal. There was a very long break in 2007 and 2008 -- no knitting, no knitting blog. 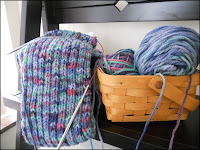 I'm glad to be back at both hobbies -- knitting and knitting blogging. The yarn cake is from my current project -- the Pickets Baby Blanket. The blanket is composed of simple garter stripes with pointing instead of flat ends. The yarn is Swish DK superwash from Knitpicks. The pattern is from Knitpicks as well. I have three or four more stripes to finish, and then a whole lot of sewing to do. Might I add another definition to the word? Arrogance is working a lace pattern without the use of lifelines. I didn't even think about using them. I am so used to being able to fix mistakes and move on that I, without thought, assumed I would be able to do that with this project, as well. A couple of weeks ago I started the Yarn Harlot's Pretty Thing. 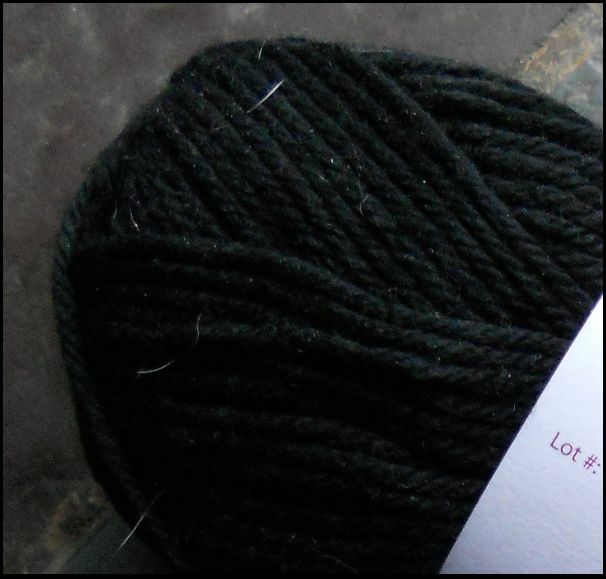 I used a lovely black yarn that I bought in Myrtle Beach a year or two ago. Start #1: I started it with double pointed needles, cast on and knitted for seven rows. I finally realized that I had twisted the circle. There is no cure for that mistake; I ripped it out. Sigh. Start #2: I cast on again. This time I got rid of the double pointed needles - not sharp enough. I switched to Knitpicks Option. I've never really knit a circle with two circular needles. It worked; I was able to do it. I think I might like DPNs better, but this was working. I had made it to row 25 or so, when I noticed an error. I arrogantly decided I could fix it, and let down the column of stitches to pick it up correctly. No way. Not happening. The more I worked, the worse the mistake became. It was compounded by more and more mistakes. I finally threw in the towel and ripped it out again. If I had used a lifeline, I could have gone back to a known correct point, but I didn't have one. Will there be a Start #3? Probably, but not until after the project has a long LONG time in Time Out. 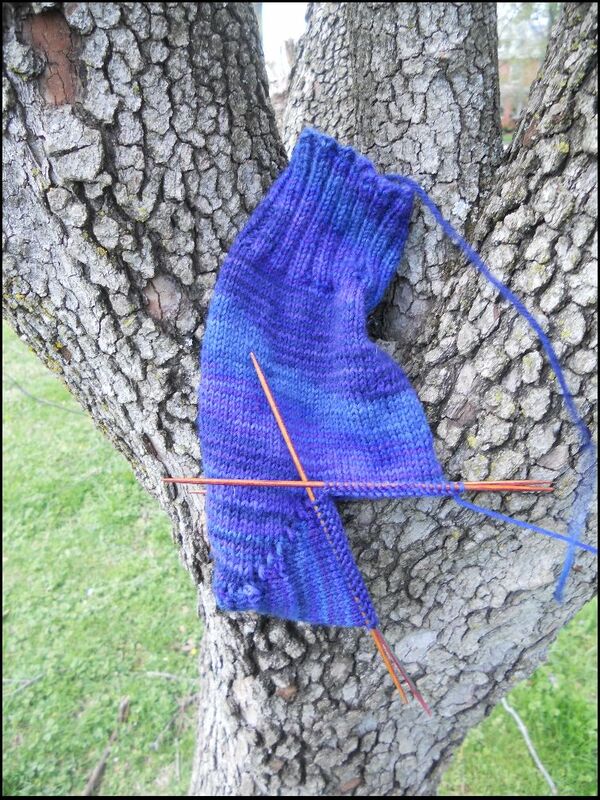 When I first started knitting -- back in 2005, maybe? -- I did it as a new year's resolution. I wanted to try to learn something new. So I did. The next year, I made a resolution to knit a pair of socks, and I did. This year, I think I want to try to improve (or create) some knitting with color skills -- maybe fair isle? I've purchased two books: Color Knitting the Easy Way (Melissa Leapman) and Mastering Color Knitting (also by Melissa Leapman). I think these will make a good start. ﻿In order to try some practice knitting, I picked up a couple of skeins of Knitpicks Swish DK in Coal and Dove Heather. While I was placing a Knitpicks order, I took advantage of a sale on their yarn swift as well as replacing my ball winder. This has made winding yarn incredibly easy, and much faster. Great!